ARIANE 5 (in its different Versions) now is since 17 years well in operational service. This is nearly half the way of the entire service time of ARIANE (first launch in 1979). The report will give an outlook about the future of this successful European Launcher ARIANE with focus on the ARIANE 5 ME as well as the ARIANE 6. It will give information about the technical features as well as the presently valid plannings. The ever increasing performance of computing tools provides unprecedented possibilities to evaluate the last single detail of, for example, a structural product. While this, per se, provides numerous novel and useful possibilities, it calls for an intelligent choice of when to take advantage of such possibilities and when they do not make a difference. When input parameters are of coarse nature, then post processing to a high precision is purely numeric, but non relevant. For example, if you are going to measure the consumption of a car over 1 km, you don’t need to measure this distance with an accuracy of a mm. This presentation will discuss similar aspects in the world of structural analysis. The high potential in lightweight design of composite parts is challenged by the need for automation of the manufacturing processes, the reduction of cycle times and process costs. Modeling the manufacturing process is an effective and flexible approach to understand and optimize the process long before the first prototype is built and to transfer the process information in the structural analysis of the part. 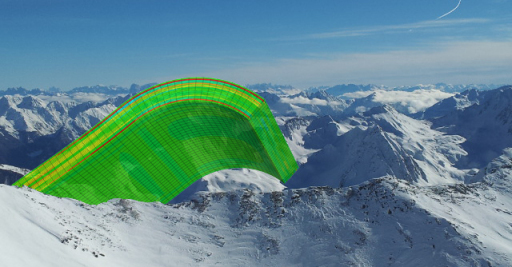 The research is based on an integral simulation platform. This platform follows "design-to-fiber" and "design-to-process" approaches and allows a customized combination of individual simulation steps (e.g. draping simulation and structural analysis) including software-neutral data exchange. The composite part is studied beginning with its manufacturing: direct preforming (braiding, AFP) or sequential preforming (draping) followed by filling simulation up to compaction, curing and consolidation simulation. The research is accompanied by the development of material characterization techniques, the validation of the simulation approach on generic structures and its application on a part level. Todays trend to construct lightweight aircraft engines requires the use of as accurate methods as possible to avoid overconservatism in the design. The thickness in the containment zones has traditionally been set by simple handbook analyses but will be replaced by more detailed FE-analyses in which a varying number of blades might be cut-off at varying positions and where the succeeding blade to blade and blade to case interactions are modeled. An essential feature is the failure criteria of the case and blades which put a lot of effort in testing, material parameters, material models, FE-analysis settings etc. An overview will be given of these challenges.Todays trend to construct lightweight aircraft engines requires the use of as accurate methods as possible to avoid overconservatism in the design. The thickness in the containment zones has traditionally been set by simple handbook analyses but will be replaced by more detailed FE-analyses in which a varying number of blades might be cut-off at varying positions and where the succeeding blade to blade and blade to case interactions are modeled. An essential feature is the failure criteria of the case and blades which put a lot of effort in testing, material parameters, material models, FE-analysis settings etc. An overview will be given of these challenges. Recent trends in virtual product development aim at including unavoidable stochastic effects into the analysis at a very early stage. One of the major sources of uncertainty in the structure is due to spatial variability of material properties (such as e.g. material strength). This may be due to inherent inhomogeneities of the materials being used, or due to process variation during the manufacturing of the components. Another important factor is the variability of geometrical parameters (such as e.g. layer thickness). Again, process variation may be an important factor leading to this variability. The outcome can in both cases be conveniently described by . Such random fields allow for a far more subtle characterization of structural randomness than simple random variables. This is due to the fact that spatial correlation structures can be accounted for in the stochastic model. The lecture will focus on the influence of spatially distributed system parameters on structural reliability and robustness. Additionally, computational aspects of random field analysis and simulation (which are of paramount importance for robust design optimization) are considered. Several Monte Carlo based methods for estimating the failure probability are tested. The methods are applied to a simplified model of the Frontskirt of the ARIANE 5 rocket, developed by INTALES. A plain Monte Carlo reference solution with sample size 5000 is compared with Subset Simulation and the sensitivity based Importance Sampling. It turns out, that a sample size of approx. 800 is sufficient to obtain a precision which is high enough. One of the fundamental difficulties in engineering is to find an optimal solution for a problem. If this task cannot be formulated mathematically or the objective function is not differentiable, "direct search" methods provide a solution. Two methods, the Nelder-Mead simplex method and a genetic algorithm, are investigated. Since engineering problems require an optimisation algorithm to handle constraints, both algorithms are enriched with this property. Numerical experiments are given in three engineering applications. Many engineering fields pose the challenging need for structures with low mass targets in order to be competitive with respect to material costs, fuel consumption and hence costs. At the same time, multiple constraints regarding allowable values such as stresses, strains and displacements have to be fulfilled. A novel method for treating this optimization problem in the high-dimensional space will be presented. The starting point of this approach is the element stiffness matrix which is modified during the FE-analysis such that all constraints are fulfilled for each element while minimizing the required material. In this presentation, the theoretical background, the logic of the workflow and practical issues for the application are discussed. Several examples will illustrate distinct features of the optimization process and show the advantages of the approach for industrial applications. In the analysis of composites, the optimization is an important task for the design of a component. From the outset several options to choose different parameters arise. Important parameters in composite optimization are the number of plies, the draping angle and the grouping number, or rather the stacking itself. The number of plies or the thickness of the laminate has to be minimal to save material, the other parameters have to be chosen optimal so that the considered failure criteria are respected. To understand the effect of the parameters and values which influence the optimization and the utilization level of the calculated stacking, a sensitivity analysis was performed. The routine can be executed at the finite element level. With the increasing computational capacity and better numerical models, sensitivity studies become a viable approach to obtain more robust designs. Still, the cost remains high. The goal of the presented research is to decrease the cost of Monte-Carlo based sensitivity studies by reducing the cost of solving the linear system of equations. The proposed solver is based on a standard iterative solver such as the well-known conjugate gradient method or the generalized minimal residual method preconditioned by the Balancing Domain Decompositioning by Constraints (BDDC) method. The solver will be accelerated by using the information of previous search directions and reusing (parts of) the preconditioner. The presented results are based both on simple algorithms implemented in Matlab as well as more advanced parallel routines using PETSc. The structural analysis of complex lightweight structures gives the challenge of lots of conflicting requirements. The resolution of these conflicts gives a very narrow and rapidly changing design space. The path through this environment over the life-cycle of the structure needs to be adaptable and traceable. Our modular work-flow allows a fast reiteration of the analysis. It assures a constant high quality and reproducibility of the models and results. It can be easily adapted to the demands of the different phases of development and production. Changes can be supplied by different teams and are continuously integrated.